Whether you’re just about to start summer band rehearsals or you’re already in the midst of them, you can bet your student leaders are feeling the excitement and the pressure that come with their new responsibilities. Maybe they’ve been to a leadership camp; maybe you’ve held your own camp for them. No doubt you’ve spent time working with them personally in preparation for the season to come, but now that full band is upon us, the masses demand your attention. On the surface, it might seem like the leaders are ready to jump in and get the job done. But that may not be the case. 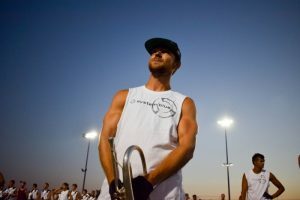 If your leaders help teach music and marching skills to their sections, perhaps their summer training has involved opportunities for them to practice teaching each other. That’s a great way for them to get some practical experience, but it’s not the same as being in front of their peers. In a real sense, your leaders may still have the training wheels on, and until they come off, they won’t really know what it’s like to do without them. As a parent, would you take the training wheels off your child’s bike and then send him on his way to figure things out for himself? Of course not! You’d be there to help him through that transition. You know they’re going to feel afraid. You know they’ll get frustrated. You know they’re going to fall. You know that the first thing your child is likely to experience when the training wheels come off is failure, and you’ll want to be there for him. The same is true for your student leaders, even the experienced ones. Those training wheels come off the first day of summer band. And no matter how much they’ve trained and planned and prepared, they’re going to experience setbacks. They’re going to fail and they need you to be there to help them through the transition. You can help them find their balance in a number of ways. Permit me to offer a few suggestions. Rather than send them off to work with their peers for an extended time, consider giving them small tasks for short periods early in the season. For instance, you might give them five minutes to teach their sections how to go to “attention” and “parade rest.” As they teach, you and other members of your staff float and observe them. Make notes on what they do well and how they might improve, and then “debrief” with them after rehearsal. As you give them more such opportunities, they’ll become more confident, which allows you to give them more complex skills to teach for longer periods of time. In any case, I recommend you and the other staff members observe and give feedback, as on-the-job training is the best way for them to become strong leaders. And your mentorship will build loyalty between you and them. I would also recommend that you not do these “breakouts” for more than 15 minutes. Even 10 minutes can seem like an eternity to a student leader who has never had to consider pacing, sequencing, reteaching, and keeping kids focused. When having your leaders teach skills that are not instrument-specific (basic marching skills, for instance) you might also consider mixing sections rather than keeping them together. I think we all know that certain personality traits seem to follow sections of the band (you know the stereotypes!). If you only do breakouts by sections, then those personality traits—good or bad—get reinforced and the differences among them is magnified and perpetuated. Consider mixing the band and allowing student leaders to work with those outside their own sections. This helps the band see the leaders as a team and provides the entire band contact with leaders with whom they might not ordinarily work. Above all, your student leaders desperately want your approval and support. Make time for them and equip them with the tools for success. Be careful not to praise them falsely! Your approval will mean more when they’ve earned it. The fact is, our student leaders have not completed their training when summer band starts. That’s when the real training begins and that’s when they need us the most. These and other topics will be the subject of future weekly System Blue tips. As always, if you have questions or would like more information, contact Frank Troika at frank@systemblue.org. With the first 6 weeks of the season completed, and a much needed week long break starting, I wanted to share some “mid-season” thoughts. As much for myself as for you, the fans. The 2016 version of The Blue Devils is a blast to work with. While I am the brass caption head and arranger, I like to get to know as many of the members as possible. Not only does the brass section have an infectious positivity, I feel the same from the guard and percussion performers. Trombones are loud 🙂 When we decided to use Trombones this year, we wanted to utilize them in a way that was unique, but still drum corps. We purposely choose to use silver plated to match the other horns. As the show has developed, and the members have become more familiar with their new instruments (many hadn’t played Trombone before) we found the Trombone was a musical character in the show. It’s been refreshing seeing the acceptance of these instruments on the field! The first 4-6 weeks of the season always seem much longer than the last month plus. It’s the “dog days”, learning the show, woodshedding your music/work, and getting to know your corps mates. Finally getting to that first show, then getting on the road, a new excitement begins to build. Having the Blue Knights and Madison Scouts in California along with our “usual friends” was a great treat! Finally performing the last 2 CA shows in the Rose Bowl and Riverside Community College was a blast. The crowds were great, enthusiastic alumni as far as the eyes could see, and an amazing energy from the corps. Well, time to go to Santa Cruz with my family, before joining my “summer family” in a few short days… Do it up Devils! Conducting is only a small part of being a good drum major. 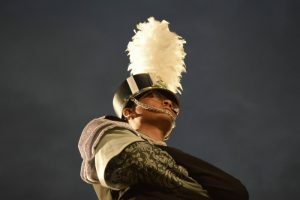 The drum major is also a rehearsal manager; a bridge between the professional staff and the other leaders, and between the professional staff and the members at large. The drum major is the conscience of the band, gently guiding the individual members to make good choices. What follows are some thoughts about what a truly great drum major can be. Share this information with your director so you can both define the extent and the limits of your responsibility. · The drum major knows the musical score and the drill before the band begins learning. He knows how the musical phrases work with the drill segments. · The drum major takes responsibility for maintaining the pace of the rehearsal by anticipating the directors’ instructions and by being alert to the immediate goal of the rehearsal. He looks for ways to assist in achieving these goals quickly and efficiently. · The drum major always takes responsibility when things are not working. He looks to himself for solutions to problems and does not blame others, even when others are clearly to blame. · The drum major always promotes the right social environment by openly cooperating and supporting the professional staff, and by projecting his enthusiasm for hard work and quality. · A drum major never projects fatigue, disgust, discouragement, contempt, anger, or hopelessness. The band must see the drum major as confident, highly competent, energetic, driven, organized, and committed. · The drum major models complete respect for other leaders and directors. · The drum major never has a bad rehearsal. By choice, he has only two kinds of rehearsals: good ones and great ones. · The drum major is an excellent musician so that when others aspire toward leadership positions, his example suggests that they must first aspire toward musicianship. · The drum major conducts himself in such a manner that the person the band sees on the podium is the same person they see away from rehearsal. 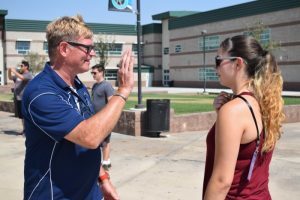 · The drum major restates instructions as necessary to help minimize student errors. · The drum major knows the music to the show on his instrument and is familiar with all other parts and how they fit together. · The drum major is able to identify problems with ensemble timing and offer insight as to the cause of the problem. · The drum major works at his conducting skills so that he is never responsible for problems with the ensemble’s musical cohesiveness. · The drum major recognizes that his first responsibility is to insure a successful musical performance. Showmanship never supersedes musicianship. · The drum major never takes breaks unless the band takes a break. He looks for ways to remain constantly engaged and involved when awaiting the next task. When there are strong rehearsal procedures in place, rehearsals are more consistent and productive. On the surface, this may seem obvious since strong procedures ought to make a rehearsal more efficient. But there’s more to it. Kids often bring their “days” to rehearsal with them, and they may not be mature enough to set aside a bad day in order to have a good rehearsal. They reinforce their emotions—good or bad—through physical behaviors such as how they move from one place to another, how they stand, how they respond to questions, etc. A snowball effect of lethargy and discontent build if negative physical “cues” are allowed to go unchecked. But strong, consistent procedures actually help mitigate the influence of these outside circumstances. Here are a few examples of solid rehearsal procedures and why they are so effective. In the exercise physiology and kinesiology professions, there’s a principle I’ll paraphrase as “The Paradox of Energy Expenditure.” It states that the more energy we spend, the more we create. When kids “hustle” back to position, they actually create more energy both physiologically and psychologically as this behavior suggests enthusiasm. The act itself helps release chemicals in the body that elevate both the mood and stamina. Socially, when the entire group moves energetically and urgently—even when frustrated!—the bottom-line effect is positive, engaged, purposeful, and united. When receiving instruction or awaiting directions, I would have my students in the “stand by” position: feet together, instrument in a fully relaxed but uniform carry position in the center of the body, chins slightly elevated, and in “silence.” (Note: I put the word silence in quotes because students were allowed to ask questions and student leaders were allowed to give instruction. But there was no “chit-chat.”) A focused environment where instruction is being delivered quickly and energetically is also a positive one. And since there’s no casual talking, there’s no complaining! In a typical rehearsal (90 minutes to 3 hours), we would not take “sit-down” water breaks. I’d have the kids “hustle” off the field to their personal water bottles and grab a quick drink. We did this frequently, but we would not sit down. When they sit, they lose energy and focus. But when they move quickly off and back onto the field, energy is both preserved and created. Another strategy is the “split” water break. Rather than have everyone vacate the field at the same time, I might send woodwinds and color guard to get water while the brasses and percussion reset for another rep (or odd drill numbers, then even ones). Almost ALWAYS, the kids taking water were quicker and more urgent with their breaks because they knew we were about to switch. What we might have lost from an ensemble standpoint, we more than gained in individual accountability and enthusiasm. Another rehearsal procedure in addition to hustling to position or standing by uniformly is hand raising. I would teach my kids from the first day that we raise our hands with fully extended arms or not at all (the same is true when I ask them to point to sets, etc.). A fully raised hand suggests buy-in, commitment, and it communicates energy and effort. When things got tedious, I’d tell the kids, “Raise your hand if you’re working hard tonight.” When 200+ hands go high in the air, the kids have reinforced their commitment to hard work through mutual affirmation. “Raise your hand if you remember what happens on Count 5 of the next move.” Again, multiple hands fully extended upward—same message. Note that I didn’t ask, “Who is working hard tonight?” or “Who remembers what happens on Count 5?” Asking “who” implies an individual rather than the group. It’s more like asking for a volunteer to respond than for everyone to respond. When energy starts to drop, or we start moving lethargically, I’ll often call for a group response to a simple question or statement that allows virtually everyone to engage in a “gesture of commitment” (hand raising, hustling to sets, snapping to attention, etc.). Since all of these behaviors suggest unity, energy, and enthusiasm, other emotions tend to be shut out (or even shut down!). SIDE NOTE: I remember distinctly a rehearsal when frustrations were very high. We were working on a particularly challenging drill transition and none of the strategies I came prepared to teach were working. After about 45 minutes of this, there was a palpable drop in energy and buy-in. The secret to achieving a super warm and round brass sound when approaching a ballad. • Set the “impact” form and play warm-ups and other show segments in that form. This helps as the performers will get more used to making music and blending next to these specific people. • Once you balance the ballad on the field, continue to perform those dynamics on and off the field. Many times a dynamic will be adjusted on the field, then not used in sectionals. This builds bad muscle memory. • Tune common chords and notes used in the production. Utilize those notes and chords in daily exercises. The more the performers get used to them, the easier performing them become. • Sing the ballad. If the performers can generate the music without the instruments, adding the amplified sound will become more pure. In the end, make music for your audience! There needs to be emotion, commitment, and energy, especially when that’s tough to do. Author Jen LowePosted on July 7, 2016 July 9, 2016 Categories News3 Comments on SYSTEM BLUE BIG GIVEAWAY!! 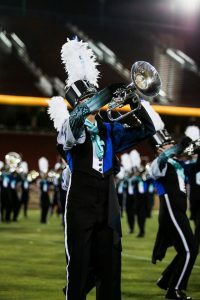 This is your big chance to win a System Blue t-shirt* and a pair of SIGNED System Blue Promark Scott Johnson Snare Drum Sticks SIGNED BY THE 2016 Blue Devils Drum & Bugle Corps A Corps DRUMLINE! To enter – show us your ‘How do you System Blue?’ creative side. Take a photo of you and your System Blue swag. How about you in your SB t-shirt, or you + your SB sticks or mallets, you + your marching shoes, or you + your SB camp booklet. Don’t have any System Blue swag? No problem, draw the logo or use the logo + you in a photo. Simple. Submit your photo and tag it ‪#‎sbswagger2016‬ & ‪#‎systemblue‬ to be entered into the random draw. Goal setting has become the motivation for success because it gives us something to prepare for and work towards. However, goal setting can actually be harmful if you think of the goal as the END RESULT rather than part of a bigger PROCESS. What if we decided to set HABITS rather than GOALS? If you are in the HABIT of producing results, you’ll achieve your goals naturally. Here are some suggestions to help you build those habits as you become the leader you envision. Establish a certain time of day and a certain amount of time (for example, 20 minutes, 45 minutes, etc.) that you’ll devote to focused effort on your goal AND STICK WITH IT! Even when you don’t feel like you got much better, you’ll still know you kept your promise to yourself and that becomes a habit in itself! If you’re SPECIFIC, REALISTIC, and have a TIME LINE, you’re almost there! If your goal is “to be the best you can be,” you really have no way of determining if you’ve reached your goal. How do you know for certain what your best truly is? Examples of measurable goals might include things like reading two chapters from a book over a weekend, memorizing the rst 36 measures of a piece of music from the marching show, or running a mile in under 9 minutes. When you can EVALUATE what you’ve done, you can determine your progress and make decisions about how to set new goals on the way to building lifelong habits. Share your goals with others. When you make your goal “public,” you reinforce the promise you made to yourself by sharing your determination. If you share similar goals with someone else, you might be able to work together to achieve them so you have ongoing accountability to each other. Focus on the kind of MUSICIAN, the kind of LEADER, the kind of PERSON you want to be and then make habits out of the day-to-day things those people would do.